Confederate Cavalrymen at Manassas Junction 1861, Orange and Alexandria Railroad, Civil War in Virignia. 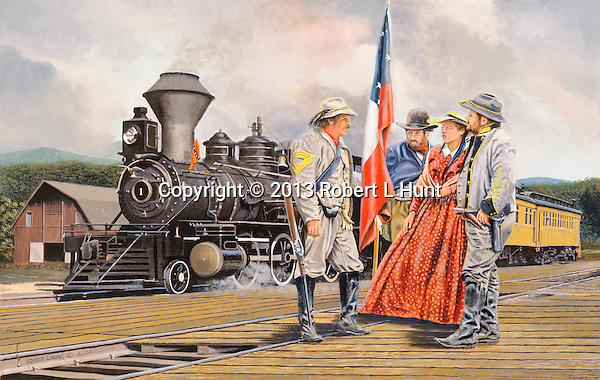 Confederate cavalrymen and two civilians in July 1861 talk of rumors of Union troop movements toward their station at Manassas Junction, Virginia, on the Orange and Alexandria Railroad, with one of their locomotives and passenger trains in the background. Oil on canvas, 18" x 28".